Low yields from wells can be the result of the drilling process in new wells or the Bio-fouling of the aquifer's formation in pre-existing wells. Hydro-fracturing - The process of cleaning the borehole with high pressure & high volumes of water. 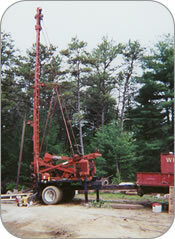 This is one of the most popular methods for the development of low-yield bedrock wells. Surging & Pumping - This method is performed with a cable tool drilling rig by running surge blocks in and up & down pattern within the borehole to force water in and out of the aquifer. The water is pumped from the hole during this process to discharge any sediment from the formation. This technique is most common in gravel wells, but also works on bedrock wells where other wells are close by and Hydro-fracturing can intercept and cause problems for those wells. High Pressure Jetting - High pressure water jets are used to remove scale from pre-existing wells or to develop newly installed gravel wells. Chemical Agitation- Chemicals are induced into the borehole, then agitated to remove iron or slime build-up.